The Zealots were the armed resistance to the Roman occupation of Israel, and caused uprisings throughout a 200 year period. They terrorized collaborators, assassinated leaders, robbed caravans and killed legionaries whenever they could, operating as urban and rural guerrillas with their trademark curved dagger, the sica. They were sicariots, dagger men. Zealots - robbers, or freedom fighters? The Romans called them sicariots, robbers, thieves and brigands. But they would hardly call them heroes, patriots and freedom fighters, would they? Once a generation or so a Zealot leader would arise who would lead a full-scale revolt – capture a city, massacre gentiles, loot arms and treasure, and finally be crushed when the Romans sent in a couple of Legions. After Jesus led his unsuccessful uprising in the Temple at Jerusalem, he was caught and crucified between two “thieves”. Neither theft nor blasphemy was punished with crucifixion; only rebellion was. When the Romans labeled Jesus “King of the Jews” they were echoing his claim from his ride into Jerusalem on his donkey, and clarifying why they were crucifying him. The two “thieves” were also important enough to be crucified. 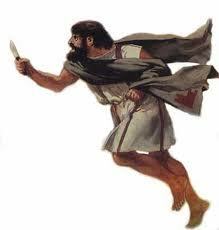 A fourth was arrested and released: Barabbas, identified as “a robber”. “Bar-abbas” is a strange name – it means “son of a father”, “son of his father”, or “Son of the Father”. He was a Zealot, anyway. In “The Gospel According to the Romans” I suggest a couple of different reasons for his release. The Zealots were active for another 100 years, until the final destruction of Jerusalem in the Bar Kokhba Revolt. This entry was posted in Military, Novel, Society and tagged Bar Kokhba, Gospel, Jesus, Jews, Joseph, Judas, Judas of Galilee, Sicariot, uprising, Zealots. ← Who were the Twelve? Cool information on the time that Jesus lived. Even though at that point it might not have been revealed to him at the time, just imagine it. Jesus may have even seen some of the crucifictions. I wonder if it came back to mind in the garden as he prayed for the cup to pass from him. This is probably a very ignorant question, but I’ll risk raising my head above the parapet… how does the CE thing work? I looked it up and see it’s an academic dating process to avoid using BC and AD, but unless I’m being very dim it doesn’t seem to correlate. Have I missed something?? i.e. 6CE is neither before Christ or after, if you’re telling us he was 12 at the time… so I don’t have a bearing when reading these dates – can you explain? There are two problems with the terms “Before Christ” and “Anno Domini – In the year of the Lord”. The first is that many non-Christians object to referring to Jesus as either the Christ or the Lord. The second is that Jesus was not born at midnight between 1 BC and 1 AD – under our calendar, he was probably born in the spring of 6 BC, rendering the BC and AD terms ludicrous. Our calendar is now so thoroughly established, however, that it is easier to rename than to renumber. Jesus’ birth year, time of year, year of death, date of death – those are all good topics for the blog, and I will get there eventually!